An American traveler in New Zealand carries a transformer to convert New Zealand’s standard 240 V to 120 V so that she can use some small appliances on her trip. (a) What is the ratio of turns in the primary and secondary coils of her transformer? 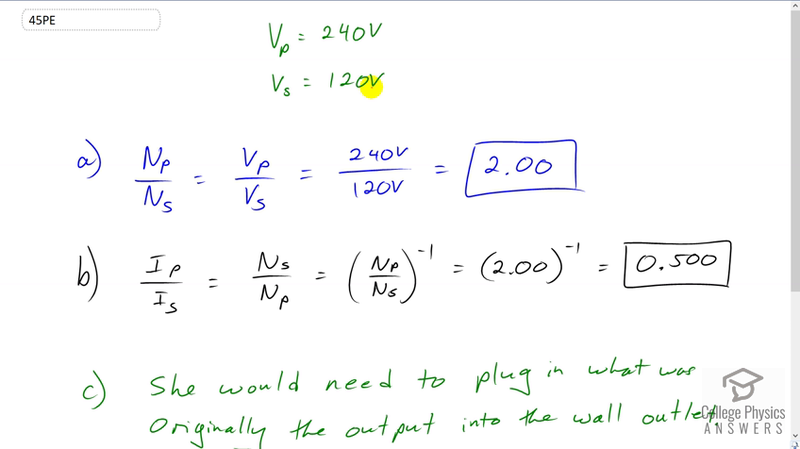 (b) What is the ratio of input to output current? (c) How could a New Zealander traveling in the United States use this same transformer to power her 240 V appliances from 120 V? She would need to plug in what was originally the output into the wall outlet. Then the original input would become the new output at 240V. This is College Physics Answers with Shaun Dychko. An American traveler to New Zealand needs to convert the 240 volts standard voltage in New Zealand to 120 volts for using in appliances purchased from America. So the ratio of the turns and the transformer we’ll have that the number of turns in the primary divided by number of turns in the secondary equals the ratio of the voltages and so that's 240 volts in the primary that's the source that's being plugged into the wall outlet in New Zealand divided by 120 volts that we need in the secondary which is the thing that she'll plug her appliance into. And this works out to two point zero zero. The ratio of the currents will be the opposite. So the primary current divided by the secondary current is going to be the number of secondary turns divided by number of turns in the primary coil, which is the reciprocal of Np over Ns and we already have Np over Ns and that is two. And so the reciprocal of two is 0.5. Now this question part C says a New Zealander using the same device traveling to the United States would have to switch the secondary and primary around. A New Zealander travelling in America would need to plug in what was once the output into the wall outlet because what was before called the secondary is the thing with the fewer coils we can see this ratio Ns over Np is 0.5 and so the secondary has less coils and that needs to be plugged into the wall and what was once the primary now needs to be the thing that New Zealander plugs her appliances into. And then it will step up the voltage in that case. So it's plugged in backwards in other words.